I got this email from a friend today. Please tell others who live in the L.A. area about this. ACTION ALERT: LA 8 HEARINGS BEGIN JULY 13! Thank you for your appreciated and welcomed support for the Los Angeles Eight case (LA8). The LA8 deportation hearing starts next week, 7/13-7/22. Thousands of immigrants from Arab and Muslim countries have been harassed, intimidated, secretly incarcerated or deported in recent year, as part of the Bush administration's ongoing campaign to curtail civil liberties and immigrant rights while silencing dissent. Michel Shehadeh and Khader Hamide were first arrested along with six other Palestinians and a Kenyan in 1987. They were held for 23 days in maximum-security cells, charged with "aiding terrorism." The basis of this charge was that they distributed magazines and fundraised for Palestinian social needs. Former FBI Director William Webster testified to Congress that after an extensive three-year FBI investigation the Los Angeles 8 "have not been found to have engaged them selves in terrorist activity." Webster testified that, "If these individuals had been U.S. citizens there would not have been a basis for their arrest." And yet today, 18 years later and counting, the government is still pursuing the case against Shehadeh and Hamide despite failing to present not a shred of evidence of any wrongdoing on the respondents part. 1. Bring yourself, friends, family, and everyone you can to attend the hearings 7-13-05 through 7-22-05 at 606 South Olive St. Los Angeles, Ca 90014. IJ Einhorn's Court. 2. Forward this email or send your own about the case and upcoming hearing and send to all contacts on your list. 3. For donations please write the checks to International Humanity Center (or just IHC)/Committee 4 justice (or just C4J), and send it to the below address. Or, write it to the IHC and put in the memo C4J. Please don't write anything else on the check. Each donor will receive a tax exempt receipt by mail. You can donate online at www.committee4justice.com. Farshid Faraji, an independent Iranian cameraman, who was arrested by the American military forces in Iraq,” is missing. Faraji, who entered Iraq on May 2nd 2005 with valid visa and proper documents to complete the filming of the documentary, “In Search of Cyrus, the Great,” does not appear on the Red Cross list. While the Red Cross has registered the arrest of Koroush Kar, the producer of the film, there is no information available about Farshid Faraji’s whereabouts. After shooting scenes in Iran, Afghanistan, Tajikistan, and Turkey, Faraji and Kar entered Iraq, in order to film the historical site of Babylon, but soon lost contact with their families. Finally, Koroush Kar contacted his family and notified them that he and Faraji were arrested on May 19th, 2005. Farshid Faraji’s family, who is gravely concerned about his safety, has not been able to find any information about Farshid from the Red Cross and the Iranian authorities. Iranian filmmakers and advocacy groups are putting pressure on the Iranian government to take appropriate steps to find Farshid Faraji. We should also ask the United States' government to provide Fashid’s family with information about their son’s arrest. Farshid's family has the right to know about his status and his whereabouts, while he is being interrogated in Iraq. Does anyone have any suggestions as to how to publicize this case? Any lawyers in the house? Human rights advocates who do international work? help! A group of us learned that The U.S. Helsinki Commission is going to have a hearing with speakers such as Gloi Ameri (conservative Republican), to adddress the human rights violations in Iran. Although I condemn the Iranian government's arrests of the Iranian political activists, I am concerned that this show of human rights by Washington neo-cons is an abuse of the concept of human rights in order to advance political and economic agendas. I am also concerned that the voices that are going to be represented at this hearing are those of conservative Iranian elites. Here is a letter and a petition we wrote. Please read the letter and sign the petition if you agree. If you don't, no need to post your insults. By the way, non-Iranians are also welcome to sign. :-). The office of Senator Brownback, the author of the Iran Democracy Act, and Chairman of the Commission on Security and Cooperation in Europe, has confirmed that on June 9th, the Commission will hold a hearing on Iran “to discuss the deteriorating human rights situation in Iran and the prospect for a joint US Europe response.” This hearing is scheduled between 1:30 P.M. – 3:30 P.M. at 192 Dirksen Senate Office Building in Washington D.C. It is now confirmed that Goli Ameri, the Co-Founder of Iran Democracy Project at the Conservative think tank, Hoover Institute, and Larry Diamond, a Senior Fellow at Hoover, will be among the panelists. The Commission on Security and Cooperation in Europe, also known as the Helsinki Commission, is a U.S. Government agency, which consists of nine members from the United States Senate, nine from the House of Representatives, and one member each from the Departments of State, Defense and Commerce. Goli Ameri was appointed by President George Bush as one of three public delegates to the United Nations Commission on Human Rights. Ameri was the Republican candidate for Congress in Oregon’s first district during the 2004 election cycle. Last year, during her campaign, Ameri wrote an open letter to Secretary of State, Colin Powel, encouraging him to take a harder stand on Iran, which stirred much reaction among Iranians. To our knowledge, Ameri has now contacted a selected number of her supporters to attend this hearing. Diamond, who is introduced on Hoover’s webpage as “a specialist on democratic development and regime change, and on U.S. foreign policy affecting democracy abroad,” served as a senior adviser on governance to the Coalition Provisional Authority in Baghdad in 2004. In his Iran Democracy Act, Senator Brownback, the author of the 1998 Iraq Liberation Act, suggested the establishment of an “Iran Democracy Fund,” according to the model that allocated money for Iraqi opposition groups in exile in 1998. Considering the political background of the organizers and participants in this hearing, we, a group of concerned Iranians living in the U.S., are worried that the plight of human rights in Iran may be abused for geo-political agendas that will only harm the development of any viable democratic movement, by the imposition of economic sanctions or military intervention. We believe that the voices of the Iranian diaspora should not be limited to the selected few that claim to represent the will of the Iranian people. Despite our objection to the arrest of Iranian journalists and bloggers in Iran, we strongly oppose military intervention or monetary support for “dissident groups” in Iran or in its diaspora, and ask the U.S. representatives to represent our voices, which are often suppressed in such hearings. 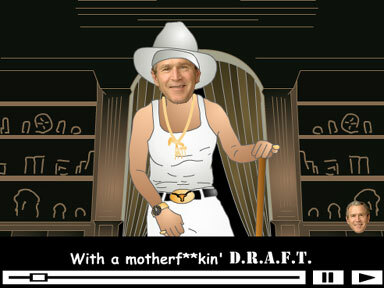 This is a funny flash I saw on Iranian.com.... Click to watch Bush rap! SFSU alumni and bebe founders, Manny and Neda Mashouf, gave $10,000,000 to SFSU. This is the largest individual gift SFSU has ever received. This is great news. God bless'em. But I am thinking since so many of bebe's ads use women's bodies, why isn't some of the money going to Women Studies, heh? Pay up people! By the way, the oral exam is over. I passed, had a cake, followed the whole ritual with chelo-kabob, and am recovering from the trauma of the exam. I have to revise the proposal a bit (a lot! ), in the next three weeks... So not absolute freedom (if there is such a thing) yet. I'll be taking my oral exam in two days and after that I'll have a lot more guilt-free time for blogging! If you have been following the Iranian elections news, you probably know that Moin, the reformist presidential candidate was re-instated. Good news for letter N. :-). Another letter N. which I read almost daily (NY Times) seems to like Rafsanjani quite a bit, though. Two articles about him in one day! Read them here and here. Moin may not be as practical for Iran's situation today, as Rafsanjani would be with his "pragmatism." But I cannot get myself to like this guy, even a little bit. I like what he says about American democracy and elections here, though, I have to admit. The sidebar image is taken from Mahmoud Pakzad's "Old Tehran", Did Publishers, 1994. Thanks to Jahanshah Javid (www.iranian.com) for sharing it.